So...I read a post on the internet the other day about a natural tooth powder. The main ingredient was horsetail. I did a little online search and discovered many more posts advocating horsetail as an ingredient and a "remineralizing" agent for the teeth. Please folks...do not use horsetail as an ingredient in your toothpastes/powders!! It is highly abrasive...it's mostly silica for (think sand and glass) and it will wear the enamel off your teeth faster than you can say equisetum arvense! It was used to polish pewter for goodness sake. I've used horsetail to clean pots that had food burned on so bad nothing would get rid the crud except horsetail. So...if horsetail can do that, think what it's going to do to your teeth. Further...you need to drink horsetail to receive the benefits of minerals. I've been doing extensive research - lots of hands on experience and reading - due to my own dental issues. If you want to incorporate horsetail into your home dental hygiene practices I do recommend horsetail as 1) a mouthwash/rinse it is an astringent (will help to tone boggy soggy gum tissue), a stypic (stop bleeding) and a vulnerary (heals tissue) and 2) prepare and drink as an infusion for the high mineral content (silica). Simply prepare your infusion for drinking and then use that same infusion as a mouth rinse. Easy peasy. I've also just chewed up fresh horsetail and applied as a dental pack for inflamed and infected gum tissue and it works very nicely. 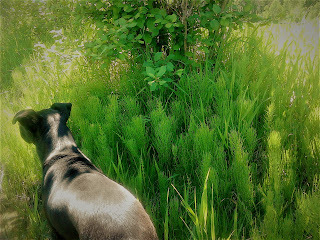 I <3 Horsetail for many reasons - it's a living fossil! Horsetail is one of the plants we'll be studying during the Medicine Making/Plant Immersion weekend June 23/24. There are only a few spots left in the course so if you're thinking about signing up you better hurry!